This Dawn of Peacemakers review was made after playing six of the 12 campaign scenarios. We were sent a copy of this game by the publisher in exchange for an honest review. What is Dawn of Peacemakers? 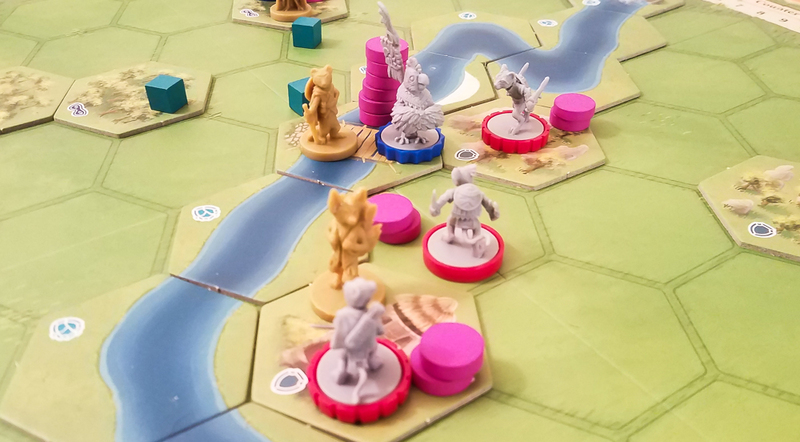 Dawn of Peacemakers is a cooperative campaign board game in which you play as a group of adventurers attempting to stop a huge war from breaking out between the scarlet macaws and the ocelots. It’s set in an alternate universe in which humans never existed and “animalfolks” rule. Dawn of Peacemakers was designed by Sami Laakso and is published by Snowdale Design. In Dawn of Peacemakers, you’ll be playing through a campaign and attempting to keep animalfolk armies from destroying each other one battle at a time. During each scenario, you’ll be moving around the battlefield trying to keep one army from dominating by influencing their actions and, hopefully, bringing each army’s motivation low enough so the battle will end. In some cases you’ll want to put the underdog in a better position to strike, while in other situations you might want to move a unit away from the action. 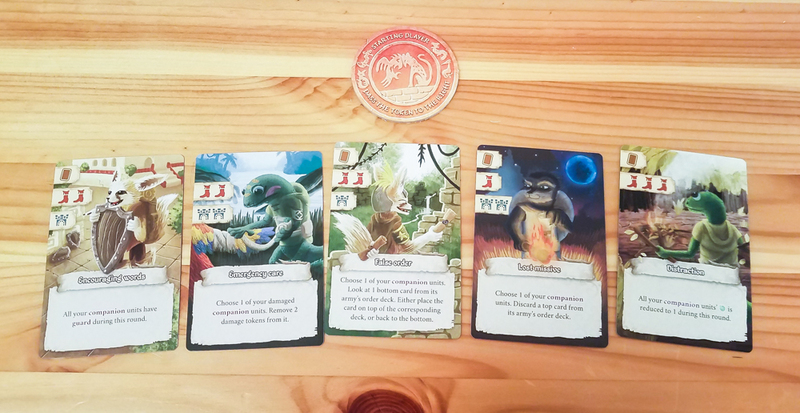 Adventure Phase – This is when all of the players get to take their actions by using resource cards. Army Phase – This is when you’ll draw and resolve every army’s order cards to see what they are going to do that round. Status Phase – This is when you’ll check to see if any of the game-end conditions have been met. The resource cards that you’ll have can be used in multiple ways. You can look at and possibly reorder cards in the order decks; deck manipulation is the main mechanic in this game. You can also move around the battlefield, use fortification tokens to protect specific locations, or you can use a resource card’s special abilities. You can play as many cards as you want to on your turn, but each card is only used for one of its actions and is then discarded. The Army phase is when all of the action goes down. Armies will move, protect themselves, or attack the other armies. Of course, your job during the Adventure phase is to do the best you can to control where the action takes place. The order cards will tell you which units in each army are activating during that round (based on the insignias on the cards and figures) and in which order they act. The ploy cards tell you the speed in which they will act and any special instructions, and the task cards will tell you the actions they are going to take that round. Resolving move and attack actions is pretty simple. Each army has a Frontline Sign that tells you their preferred direction for movement and attacks. When attacking, units will want to attack the closest enemies in the direction of their Frontline Signs and within their range. There are helper cards included in the game that can help you figure out enemy prioritization when there are multiple targets. Each animalfolk unit has stats and possibly a special ability. If a unit is attacked and takes damage, you’ll place damage tokens next to them on the board. If their damage meets or exceeds their health stat, they are removed from the board and that army’s motivation goes down by one. Each scenario will tell you how you win and lose; you’ll always lose if an army’s last leader is killed. If one of the game-end conditions is met at the end of a round, you’ll read the story text in the campaign book before moving on to the next scenario. Each new scenario can add in more campaign content. The campaign is the main way to play Dawn of Peacemakers, but you can also play any of the scenarios as one-off games and there is a full competitive Skirmish mode included in the box as well. This is a really cool theme. I thought that not being in the fight might lack excitement, but you’re very much involved as the ones trying to manipulate and end the battles. I love the overall look of Dawn of Peacemakers. The artwork on the tiles and cards is great, the miniatures look fantastic, and even the rulebooks have a high-quality look and feel to them. I never knew deck manipulation could be this much fun! In other co-ops you can have special abilities that allow you to reorder event decks, but those actions usually aren’t too interesting or exciting. In Dawn of Peacemakers it’s pretty much always exciting because you can only look at so many cards each round and you have to commit valuable resource cards to do so. You have to evaluate the current battle situation and hope that everything ends up happening in the right order. It’s also really cool how the map layouts change how each battle plays out. There are some areas where units are safer from their enemies and also more vulnerable areas where units can take extra damage. You’ll mostly be focusing on the different units’ strengths and weaknesses, but you also have to think about how you can use the battlefield to your advantage. This game has a surprising amount of replay value. Most people are only going to play through the campaign once, but you can play any of the scenarios multiple times and even customize them. 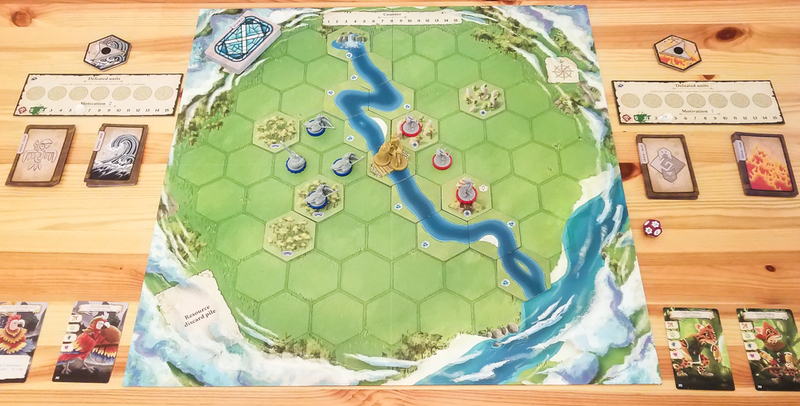 It also has a dedicated skirmish mode rulebook, which has unique rules for competitive play. This is definitely not the type of game you’ll play through once and be done with it. The rulebooks are excellent. The campaign book will slowly walk you through the basics of the game and it covers new mechanics as they pop up. There is also an index booklet that you can quickly reference whenever you need to. The campaign has plenty of great surprises… and that’s all I can say about that. The four adventurers all have unique backstories, but nothing differentiates them when you’re actually playing the game. They all use cards from the same resource deck and they don’t have special abilities, which is kind of a shame. Sometimes the battles’ endings aren’t too exciting. Multiple times we were just waiting for certain cards to pop up in the order decks so we could finish the scenarios. I think it’d be cool if the adventurers could get hurt, maybe losing a card each time they take damage. They are in the middle of these battles, after all, so it just makes sense that they’d take a little bit of damage. I wish there was a different way to track health. 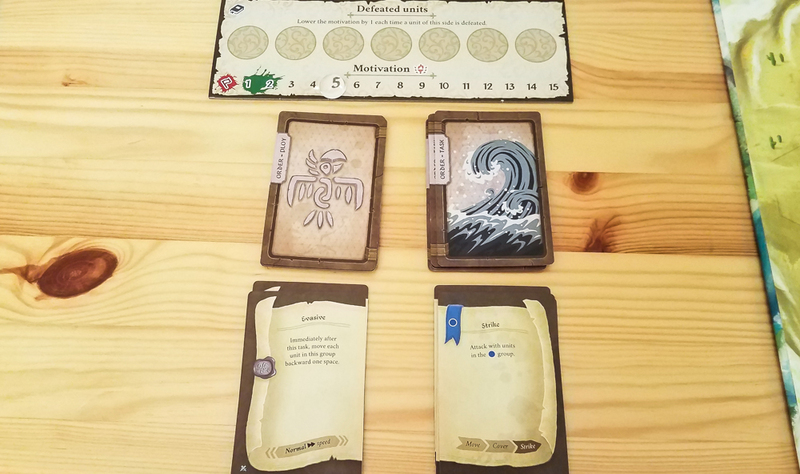 The damage tokens can clutter up the board and you have to move them around with the miniatures. Dawn of Peacemakers is unlike any co-op game I’ve played before and it absolutely met my high expectations. The text in the campaign book and the battles themselves help to create this very unique and memorable story, and I’m a huge fan of the all-around look of the game. My group has only played half of the campaign so far and we’re definitely looking forward to seeing how the story plays out and the different challenges each scenario will bring. I can’t think of any games to compare Dawn of Peacemakers to, but I will say that you should give it a try if the theme interests you. If you think your group will enjoy playing through a campaign in which you’re trying to stop a huge war from breaking out between two groups of animals, get this game. 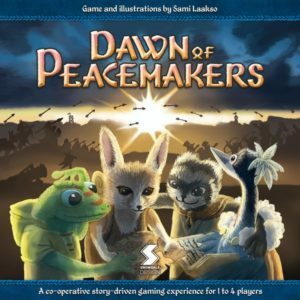 UPDATE: Dawn of Peacemakers made it onto our Best Cooperative Board Games of 2018 list! Thanks for taking the time to read our Dawn of Peacemakers review! To stay updated on all things cooperative board games, follow us on Twitter, Facebook, or via RSS.